A new bar has opened in the historic Red Lion Yard in Rotherham town centre. The Red Lion Bar and Lounge offers an extensive cocktail menu, over 70 spirits and a special station to add some sparkle to your prosecco, in a modern and relaxing atmosphere. Paul Gill and Joanne Wood opened the bar in May after taking on the lease, and Paul single-handedly renovated the former pub, adding his own personal touch by displaying his childhood Chopper and Tomahawk bikes up on the walls. 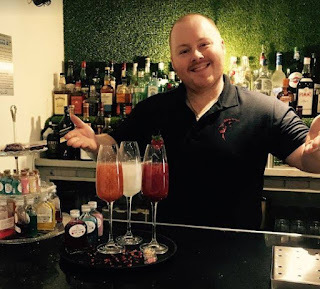 Owner Paul (pictured) said: "Rotherham's nightlife hasn't really existed for a while, apart from a few traditional pubs, so we wanted to join other new bars in town and bring something different to help bring a social life back to the town centre, somewhere couples can come and relax in a nice setting. "The last couple of months have gone really well, we've got regular couples who visit, and we've been really busy in the warm weather. The yard is a great place to sit and enjoy a drink in the sun now that we've cleaned it up after it was once a no-go area. "We have ideas and plans for the future once the bar is established, including a tapas-style food menu." Cllr. Denise Lelliott, Cabinet Member for Jobs and the Local Economy at Rotherham Council, added: "I'm delighted to welcome The Red Lion Bar and Lounge to Rotherham's town centre to join the likes of 1915 Bar and Bistro and the George Wright Hotel, Bar and Restaurant. Its arrival will certainly contribute to the town centre’s transformation as a leisure destination as we move towards the development of Forge Island and the Masterplan. I wish Paul and Joanne all the best of success in their new venture." Whilst not a listed building, the front of the Red Lion at 39 - 47 Bridgegate, is on Rotherham Civic Society's local list which compiles properties of architectural or historic interest. The society states that: "Providing frontage to the historic Red Lion Inn, which in the early 19th C had frontage to Bridgegate at No. 39. In 1927 this building and the adjoining shops were rebuilt by Tennant Brothers Brewery of Sheffield in a mock Tudor style. The new building was three stories with showrooms and offices above the shops, and extended over the access to Red Lion Yard. "Rebuilding of the property was necessary to comply with a new street improvement line which was required in connection with the creation of the bus terminus in All Saints Square." Rothbiz reported earlier this year that at 43 Bridgegate, plans has been submitted for a change of use of the first and second floor to residential, whilst adding a new shop front to the rear of the property. Subsequent plans would enable a new nail bar to open onto Bridgegate. Good news, at last, I will be popping in for a drink with my wife when next in town always nice to have a choice, hope the venture pays off. I wish them the very best of luck, they will need it as the town centre as a whole really suffered. It would be nice if a few more pubs/bars would reopen, the cross keys for example or Hare & hounds (William fry) ?